"If you had unlimited funds and could have one bike for every day of the week, what bikes would you choose? Please do a blog post listing which bike you would choose for which day of the week and why. After posting, please leave a comment on this post linking your blog post." I've only been riding a short time so I haven't looked around much. This is what I've been able to come up with. I like the way the R1200GS looks with a sidecar and since I don't need to be able to reach the ground, it would be about the only way I would be able to ride the GS. The F650GS (single or twin) is about the only other bike that I've ever thought about getting. They have more than enough power for me and you can still find them with the 21" spoked front wheels. I took one on a demo ride during the rally and it fit me just fine. 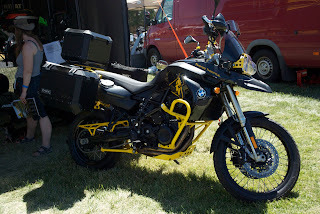 This particular one was at the Twisted Throttle booth showing off a lot of their stuff. Both of these photos were from the BMW MOA rally in Bend. Another that I thought looked interesting were the Zero electric bikes. It would work for commuting or running errands in town but so would a scooter. I had never heard of a Vincent before Bobskoot posted some pictures of one last summer. I was really attracted to all of the exposed mechanical bits. Maybe the last one on my list is the Sportster Nightster. I've always enjoyed the sound of a stock Harley and this one is lighter than many of their other models. Plus it is available without forward controls. I rented an 883 a couple of years ago just for a day and thoroughly enjoyed riding it. Still a few short of Trobairitz's challenge but that's what I've been able to come up with. I'm getting ready to head north so this was a great diversion. Thank you! with your 5, and my Two (V-strom, and Yamaha TW250) we have 7 bikes to share. That is the good thing about reading blogs where many of the contributors have something in common - we can all learn from each other. Not riding long hasn't given you much exposure to different types of bikes, but you have learnt from Bob about Vincents and today, I learnt something from you. I had never before seen a R1200GS with a sidecar attached, so I appreciate you including that in your list and showing us what one looks like. Nice idea with the RS1200 with a sidecar. I think only coming up with five bikes makes you frugal. Maybe is a testament to your sensibilities that you couldn't come up with seven and the rest of us had trouble paring the list down. I, too, have been thinking about this challenge and like you I can't come up with 6 other bikes I'd want. Maybe it is from not being a long time rider. I like the sidecar choice and the F650GS is sweet. Even without a single Ducati? 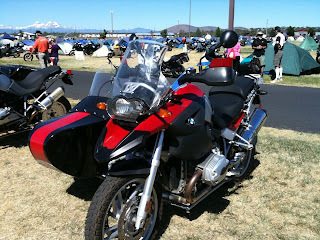 There were a number of GS bikes at the BMW rally with either a Ural or the DMC sidecar. It seems to be a popular combination. I don't know about sensible as lack of imagination. Thank you for creating the challenge. I thought for sure that you would have a sidecar on your list after your visit to MN. I really like the way that F650GS looks though I'd be afraid to ask how much all the bits and pieces add to the price.